If David Duke Can’t Be On Mainstream TV & Radio, Why Is Pat Buchanan? What kind of political pundit would you expect to hear on a radio talk-show sponsored by neo-Nazis? What kind of author wants to sell his latest book to an audience composed of white supremacists, Holocaust deniers and Christian militiamen? Would you expect such a pundit and author to be a “regular” on MSNBC, PBS and have a column that appears in mainstream newspapers across the country? 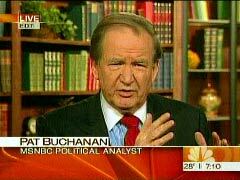 Last night (11/22), Pat Buchanan appeared on The Political Cesspool to hawk his latest book. 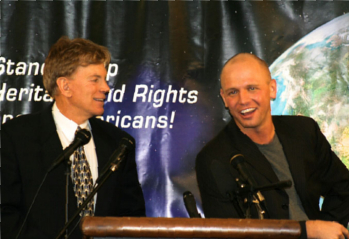 A word or two about The Political Cesspool: It is talk radio show founded and hosted by white supremacist, James Edwards. The Cesspool is broadcast by Liberty Radio Network and Accent Radio Network. It is also frequently carried and promoted by Stormfront Radio, a service of the neo-Nazis Stormfront website. Sponsors of The Political Cesspool include the white separatist Council of Conservative Citizens and the Institute for Historical Review, a Holocaust denial group. One can’t help but wonder what proverbial line Pat Buchanan must cross before media outlets like NBC and PBS, declare him persona non grata. Would David Duke be welcomed to the round-table discussion of the The McLaughlin Group? Would CNN or MSNBC put out the welcome-mat for Reverend Jeremiah Wright? Considering Buchanan’s long history of racial and ethnic incitement, how is it that he is still viewed as a legitimate, authentic, mainstream voice for the political right? Is it because America has drifted so far to the right? Or is Buchanan is just slimy enough and chummy enough with the powers that be, that he will forever be welcomed to march on to the mainstream media stage wearing nothing more than his ethereal Nazi jack-boots and Klan hood?